The New Audrey Hepburn likes them, and if that's not enough for you then CLUAS (think Peter O'Toole in 'How To Steal A Million') is also swayed by their dreamy, literate and beguiling (but chorus-less) folk-pop - intense but just pulling back from being over-serious. When Natalie Portman (in US indie-movie 'Garden State') says that The Shins (their 2001 song 'New Slang', to be precise) will "change your life", that's probably recommendation enough for a lot of people. Now CLUAS's charms are hardly Portman-esque (oh go on then, disagree if you must) but neither have we p*ssed away our cool by slumming with the geeks in 'Star Wars'. And besides, she might only have said that because she was paid squillions of dollars to read it off the script. How can we be sure? Never fear - you're on much safer critical ground when good ol' CLUAS assures you that The Shins are indeed a fine band and that you should definitely listen to their new album. 'Wincing The Night Away' (great title) will probably remind most music fans of the Go-Betweens brand of acoustic pop, as it sways between Forster-esque happy-go-luckiness (especially on a marvellous song called 'Australia', which is surely not a coincidence) and McLennan-y bruised romanticism (most of the other tracks). That lead Shinner James Mercer can write such compelling and beguiling songs as 'Sea Legs' and 'Phantom Limb' without a single chorus is testament to his craftsmanship. Particularly captivating are his lyrics, as evocative and densely-packed as those of the aforementioned Forster and McLennan. Again, 'Australia' stands out in this regard, with a breathtakingly romantic opening couplet ("Born to multiply / or born to gaze into night skies..."), a second verse of sustained hands/fingers imagery and the joyous finale of "so give me your hand and let's jump out the window". Dizzying stuff. 'Sea Legs' almost matches it: "Girl, if you're a seascape / I'm a listing boat / for the thing carries every hope..." The other songs are just as poetic and imaginative; I won't spoil your pleasure of discovery by quoting any more. Sonically, Mercer and Joe Chiccarelli at the faders do a great production job - like the lyrics, the sounds are layered and intriguing without ever feeling cluttered or stuck-on. And Mercer has a soaring, plaintive voice that was built for big venues. All he needs is just one hook-filled radio-friendly chorus and The Shins will be massive. In the meantime, they can still be your 'secret' band. Yours and Natalie's, that is. 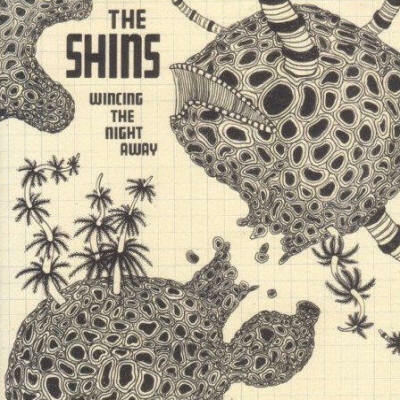 Check out CLUAS.com's 2002 review of The Shins' debut album. Check out Aidan's blog entry about the disappointing Shins gig in Paris.